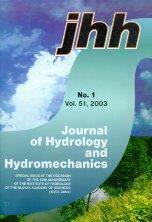 JHH is an international open access journal for the basic disciplines of water sciences. The scope of hydrology is limited to biohydrology, catchment hydrology and vadose zone hydrology, primarily of temperate zone. The hydromechanics covers theoretical, experimental and computational hydraulics and fluid mechanics in various fields, two- and multiphase flows, including non-Newtonian flow, and new frontiers in hydraulics. The Journal publishes original research papers, short communications/technical notes, and reviews that have been thoroughly peer reviewed. The Journal is published jointly by the Institute of Hydrodynamics of the Czech Academy of Sciences, v. v. i., Prague, Czech Republic, and the Institute of Hydrology of the Slovak Academy of Sciences, Bratislava, Slovak Republic.